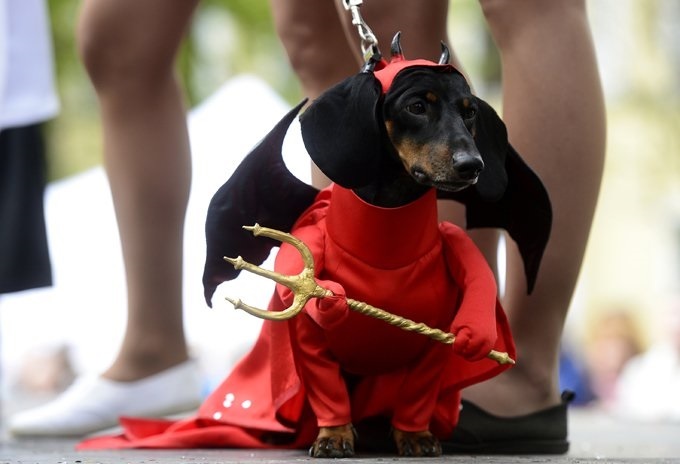 Wiener Dogs in Halloween costumes–that’s one of our favorite things about the holiday! Their adorable, long, little bodies are perfect for playing dress up. It’s almost Halloween! Do you have your costume picked out? Time to get cracking. Costumes always come with a warning: If your dog is not happy playing dress up, we advise you not force the issue. Never force a dog into any kind of costume. However, there are lots of dogs who enjoy dressing up and playing human with their favorite humans and that’s okay too. Here are 10 dog costumes that are ideal for wiener dogs! Ahoy matey! This wiener dog loves the open oceans! 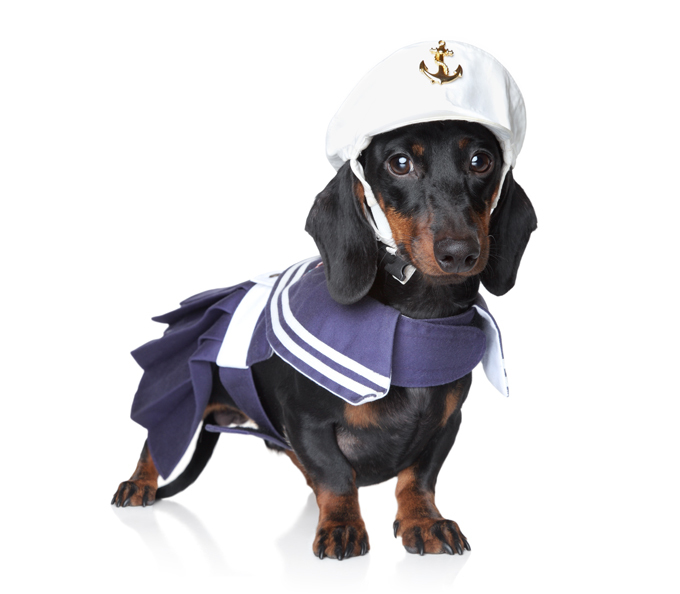 Get your pup a sailor costume on Amazon! 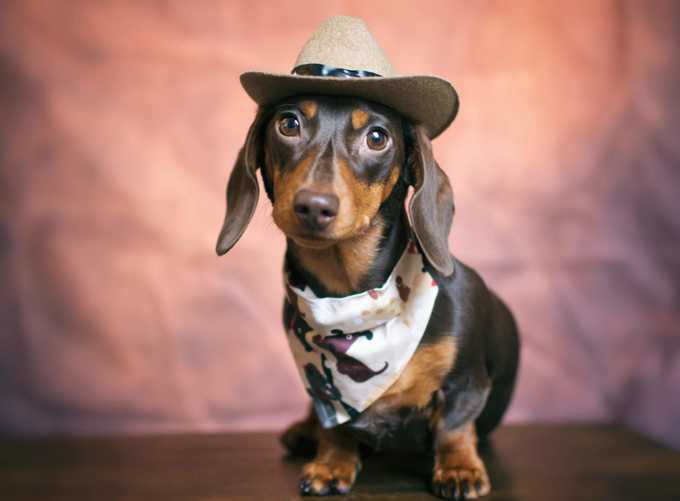 Your sweet wiener will look so rough and tough in a cowboy or cowgirl costume! Get your pup the best cowgirl costume on Amazon! Make your dog magical on Amazon! The hot dog costume really is a winner for wieners! Turn your wiener into a wiener on Amazon. How cute is this little stinker?! Dress up your stinky pup with a costume from Amazon! Professor Wiener Dog! I love that this is simple and your dog would sure look handsome in pictures! Find bow ties for your Doxie on Amazon! Unleash the superhero in your dog. Find doggy Spider-man costumes on Amazon! If you dress your pup like a reindeer your pup will get a chance to wear the costume again I suspect. Like, around Christmas! I love this hand crochet reindeer antlers. Also doubles as a pooch warmer. Find some similar styles on Amazon! There are a lot of cute costumes that put a rider on top of your pup. All of them are hilarious. Find costumes like this on Amazon! Turn your wiener into a wild ram! 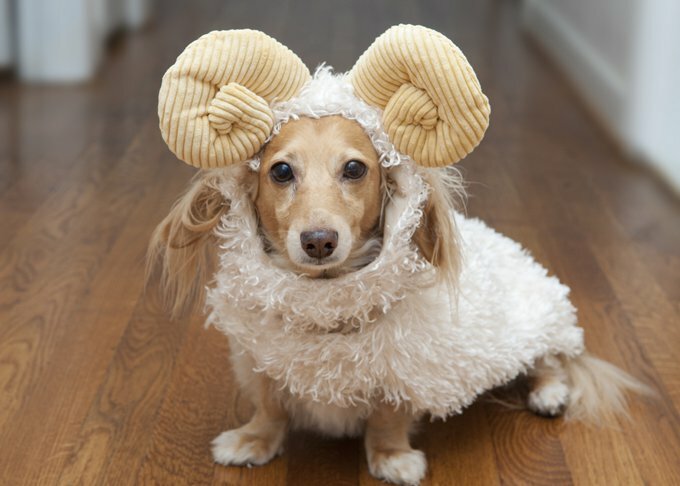 Charge into Halloween with a doggy ram costume on Amazon! A few basic guidelines for when it comes to putting your adorable pup in a costume. Never leave your dog in a costume unattended. You just never know what can happen. Avoid costumes that are bulky and could cause your dog to overheat. Avoid complicated costumes. Keep it simple is always a great rule when picking out a costume for any pet. Avoid costumes that cover their entire heads. You never want to impair a dog’s vision or ability to move their heads and drink water. Never put a costume on your dog that limits mobility. That’s just not right. Take your pics and remove the costume as soon as you can so your dog can get back to being a pup. If your dog doesn’t like wearing costumes, don’t make your dog wear one. It’s always best to take your pics and then remove any items that make your dog uncomfortable. Always keep your dog on a leash when trick-or-treating. Make sure your dog can’t get access to toxic candies on Halloween. Make sure the kids put their candy in a secure place.